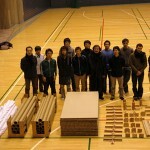 SHIGERU BAN ARCHITECTS are currently preparing to deploy simple partitions for evacuees taking shelter at gymnasiums in the Tohoku region. 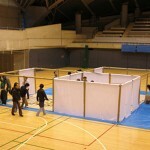 For people taking shelter in these sites, it is necessary to avoid distress from the lack of privacy and high density. 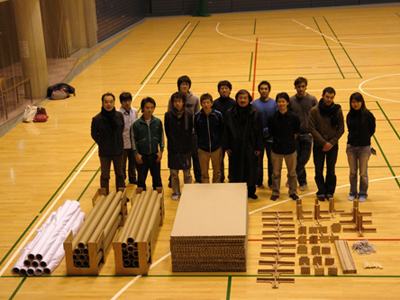 SHIGERU BAN ARCHITECTS asks for support of this important disaster relief endeavor. Donations made to the following account are very much appreciated. When the Fukuoka earthquake struck in 2005, ten years had passed since the Hanshin-Awaji earthquake, the last time a seismic intensity over six was recorded in a large Japanese city. The main issue in the first phase at evacuation sites is the high density of refugees. Privacy is needed due to the lack of close relationships between neighbors in everyday life. Simple cardboard sheets were offered for insulation and to create a border between families. 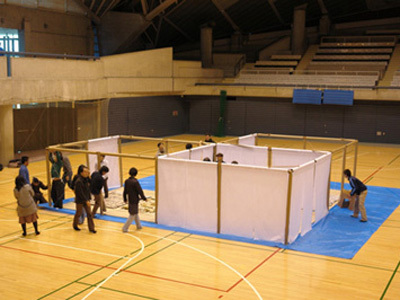 The cardboard was only used to cover the floor in early crowded times; after the population decreased, the cardboard was used to create partitions for night time privacy. Thank you Shigeru Ban Architects for your immediate and compassionate work bringing shelter and privacy to people who are homeless after earthquake and Tsunami disaster.